In medium size salad bowl add cabbage, carrots and green onions. In small bowl whisk together vinegar, oil, sugar, mustard, caraways seeds (optional) salt, pepper and hot pepper sauce. Pour vinaigrette over cabbage mixture and toss lightly to coat. Chill 2 hours or overnight. Yield: 6 side dish servings. 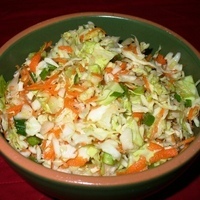 My Grandmother used to make a Slaw like this!...but the dressing had celery seeds and it was briefly boiled and poured over the cabage while still hot...thus wilting the cabbage slightly and releasing some of the cabbage juices into the dressing...then she would chill it. The technique achieves a bigger flavor in less time. I'm so glad you reminded me of this! So good with fried chicken and fried shrimp as well. In my recipe box for summertime fare. This looks delicious salad foodie! Will have to give it a try over the holidays!